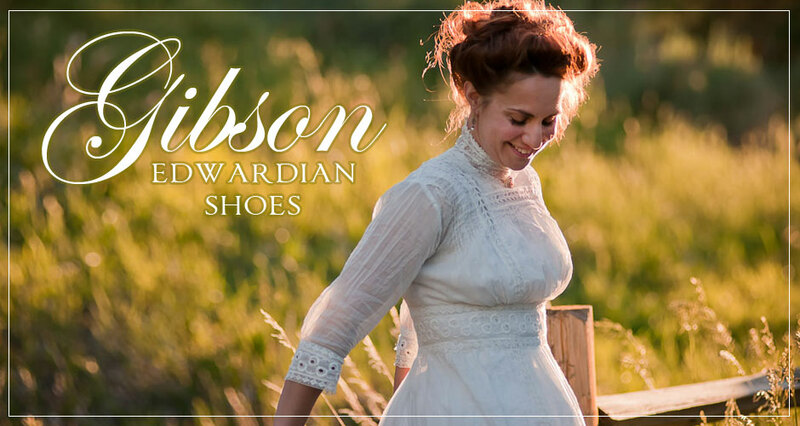 A couple weekends ago, Chris and I ventured out with our gorgeous Edwardian model Liza, to shoot the new "Gibson" Edwardian shoes that have just come into stock. 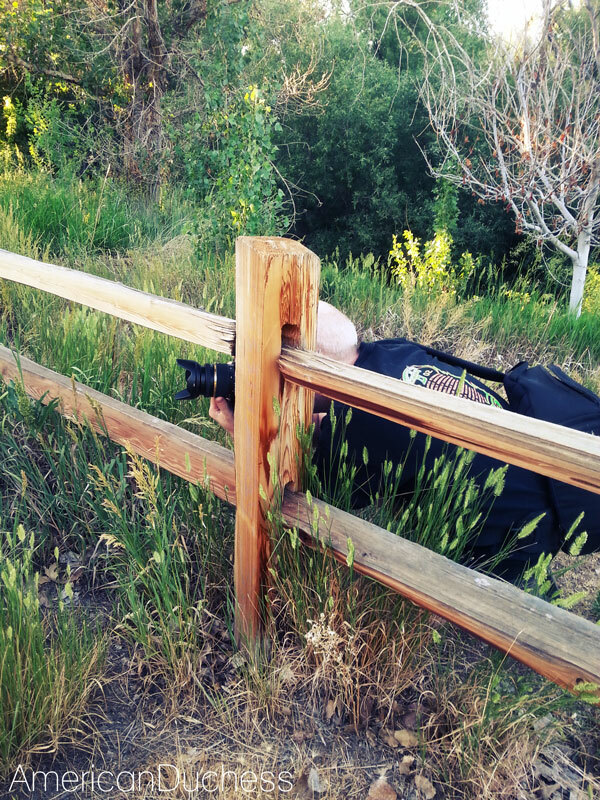 We shot on location in our favorite local park, Rancho San Rafael, which has served for our French countryside before. 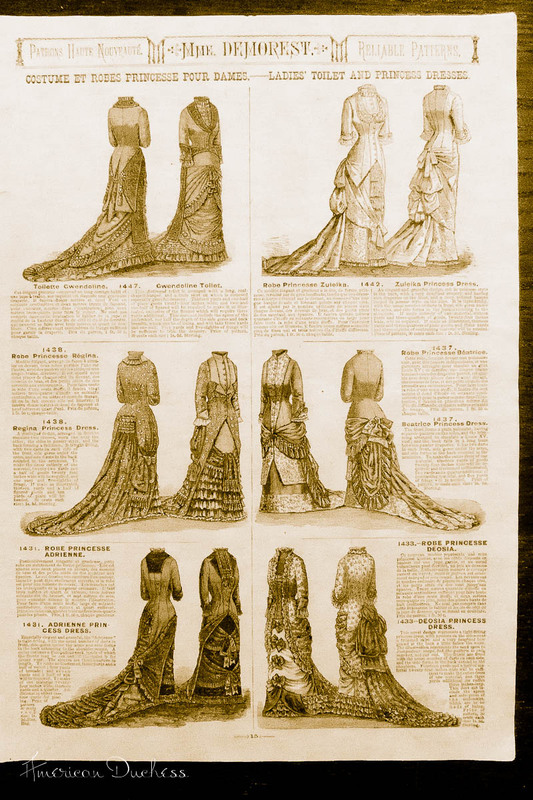 This time it played the role of Edwardian Western ranch, or perhaps a central park promenade somewhere sophisticated. You'll see Liza on our website, Facebook page, and also gracing the cover of our new Summer catalog. 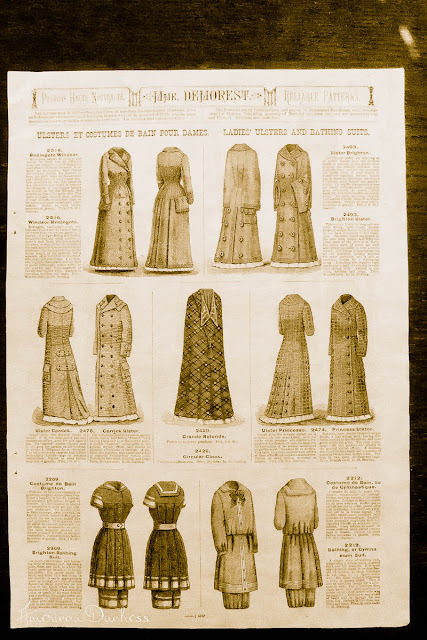 We hope you enjoy these photos of Liza, and that they inspire Edwardian creations and dress-ups of your own. If you've like a pair of Gibsons, they come in three colors (black, butterscotch, and dyeable ivory), and you can find them at www.AmericanDuchess.com. 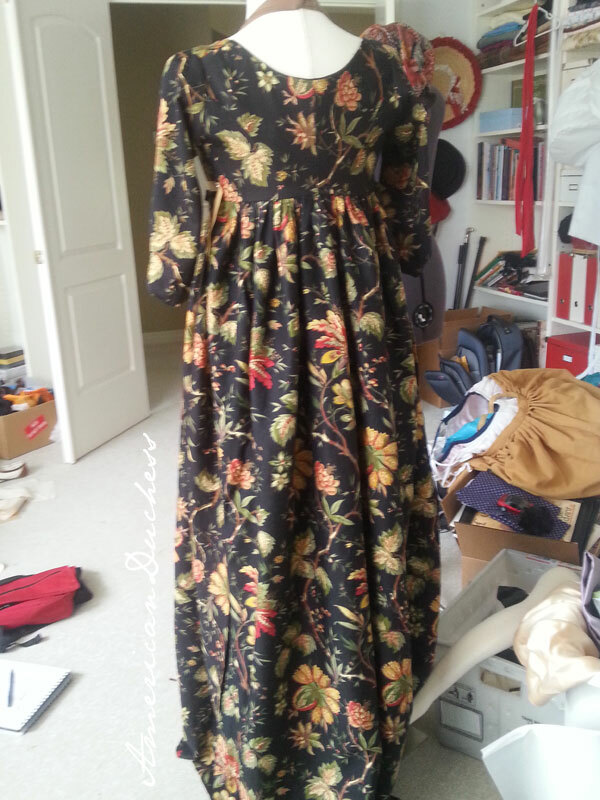 I've been stitching along on this 1790s chintz gown, little by little, fiddle by fiddle. My apologies for these terrible photos - someday I will find my camera's battery charger and stop having to use my phone! 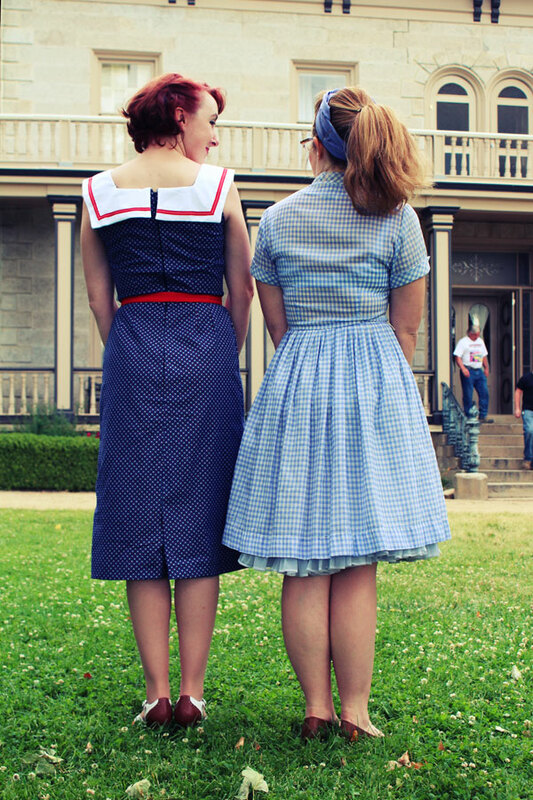 This past weekend was The Weekend of Costume Picnics. My Facebook feed has been exploding with the photographic evidence, and we here in Northern Nevada also partook. 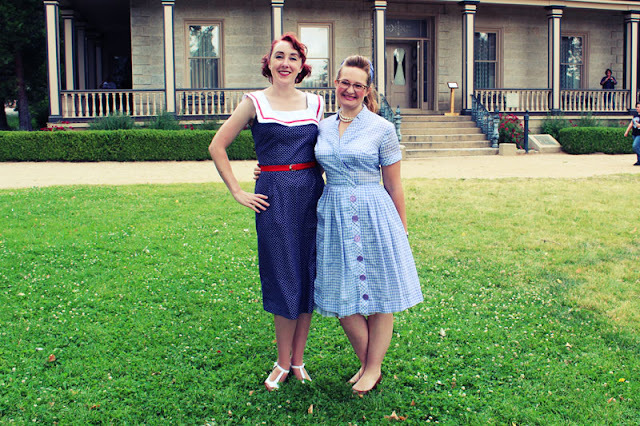 Despite the weather being poor, our local costume club invaded the lawn of Bower's Mansion. Ours was a multi-period picnic - no specific period was indicated, so we had costumes from 1890 through the 1950s. Debbie (Vintage Dancer) and I represented the '50s contingent, she in a lovely vintage find, complete with vintage petticoat (I'm jealous of that petticoat! ), and I in a quick project with one of the vintage patterns I picked up a couple years back. The pattern was Advance 6643, View 1 with the slim skirt. 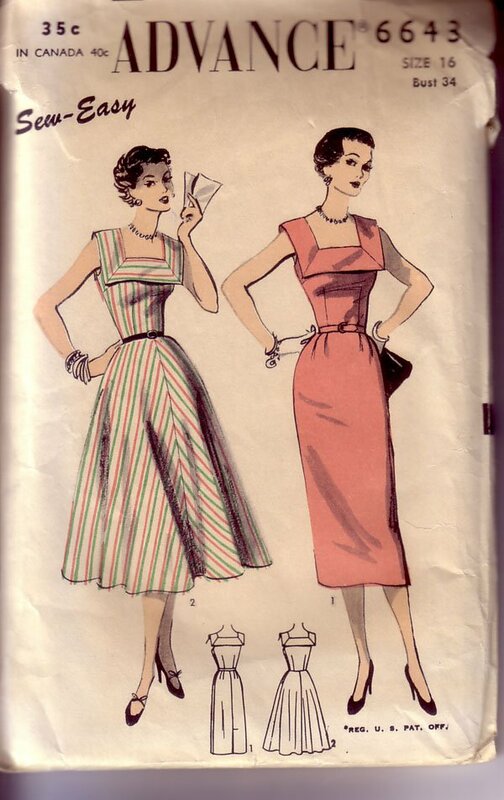 I had some red, white, and blue cotton Debbie had given me, for the main portion of the dress, paired with a white cotton with red ribbon trim for the massive oh-so-'50s collar, and red cotton for the belt. 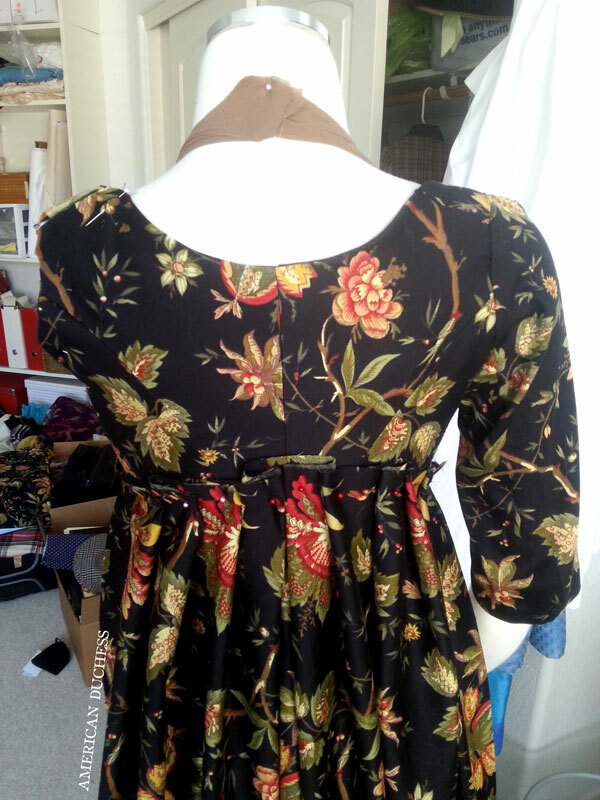 I was pleased with the fit - it was one of the only patterns in that bulk purchase that actually fit my measurements (the rest were a size too small). 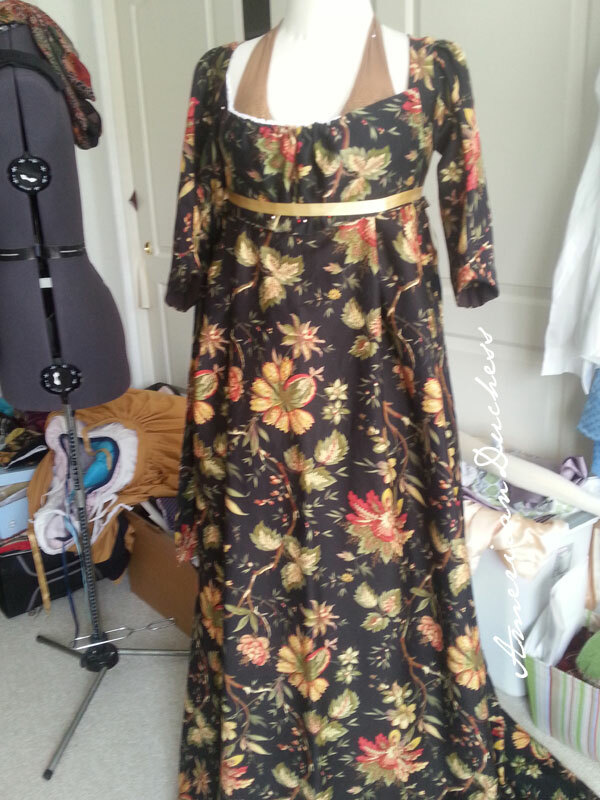 For alterations, I moved the zipper from the side to the back, on account of yardage restrictions, and dropped the waist by 1/2", which turned out perfectly. Apparently this is called a "Florentine" collar. I'm very happy with the result, particularly the fit. My only gripe is that the big square collar is sortof droopy over the bust, and my corner-turning on the neckline wasn't very well-executed. 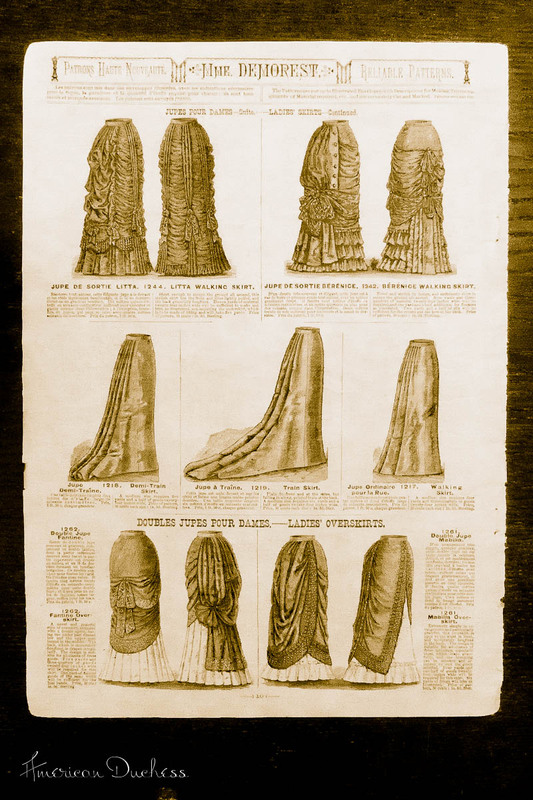 These things aren't enough to bug me into deconstructing the dress, though. All in all, I'm chuffed with the pattern, with or without the big collar - it's a great basic sheath, simple to put together, with a great fit. p.s. Please excuse my lack of photos - I still haven't found my camera charger. These photos were taken by Debbie's husband Oscar. I hacked up my Robe Royaliste pattern, shortening the waist up to the empire line, then added the sleeve pattern from my 1780s cream Indienne gown (the only sleeve I've ever drafted that actually fits), and there we go. 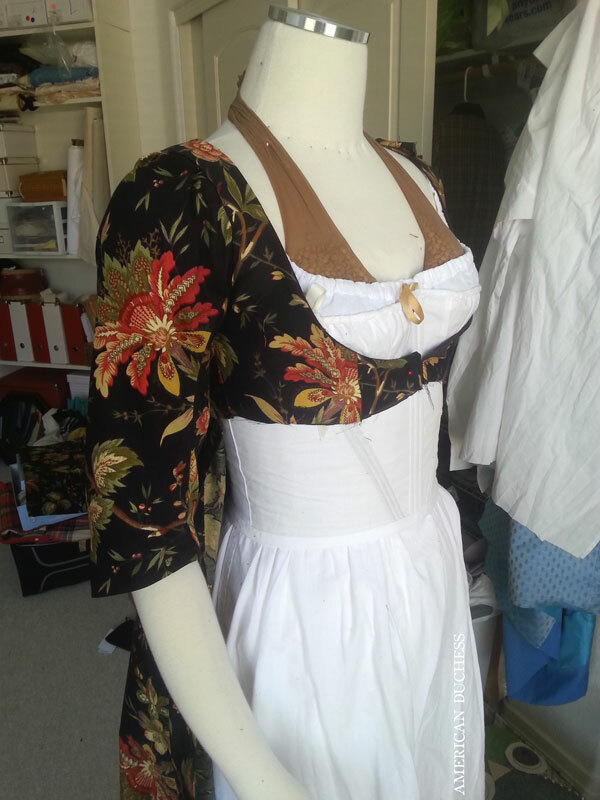 The back of the bodice with the skirt just haphazardly pinned on, so I can see how it will sortof look. This fabric doesn't mirror patterns, so I tried to cut the pieces so that there would not be any obvious repeats, especially in the center back (had this problem on my ivory version, and it bugs me to this day). I decided to deal with the drop-front portion of the gown after completing the back and underbodice on the front, since it will take some mocking up to get the neckline. In the process I was tickled to find that without the bib and front skirt panel, you just have an open robe. 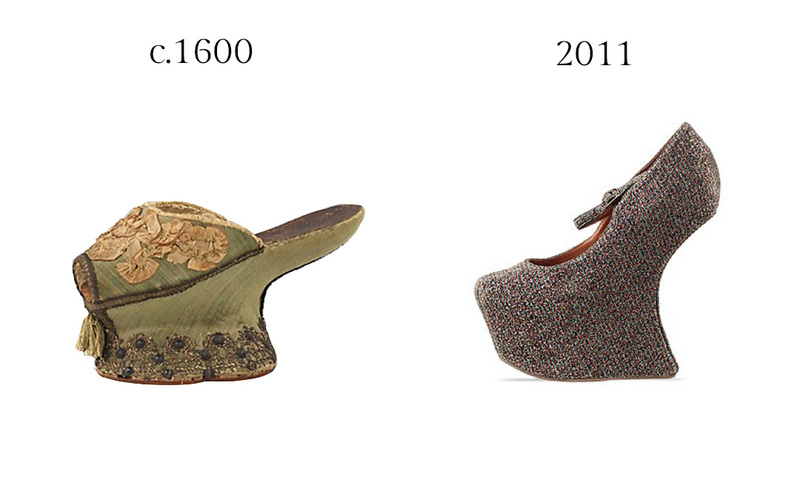 How do you gals feel about chopines, then? Would you like to see chopines added to our shop? A seedling of an idea - velvet, moderate platform, without heavy trims, so you can decorate your own. Thoughts? 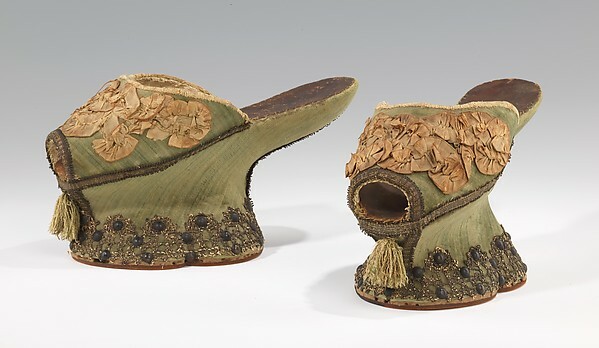 Bata Shoe Museum - late 16th c.
....that was a lot of 'R's, lol. 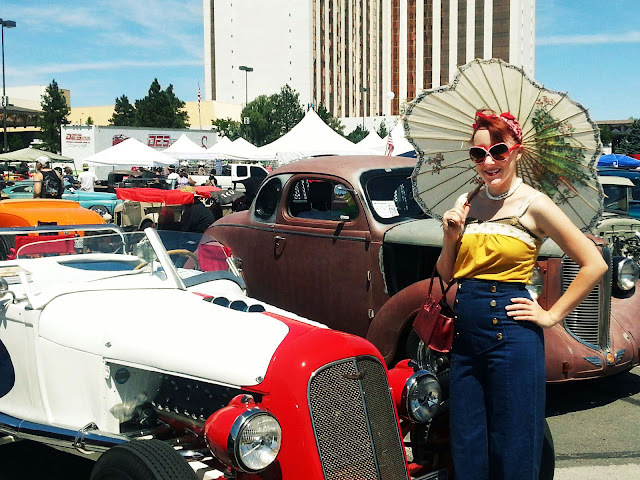 This past weekend, my friend Stephanie and I visiting Reno Rockabilly Riot, a cute little event with a few vendors and a lot of cool cars. 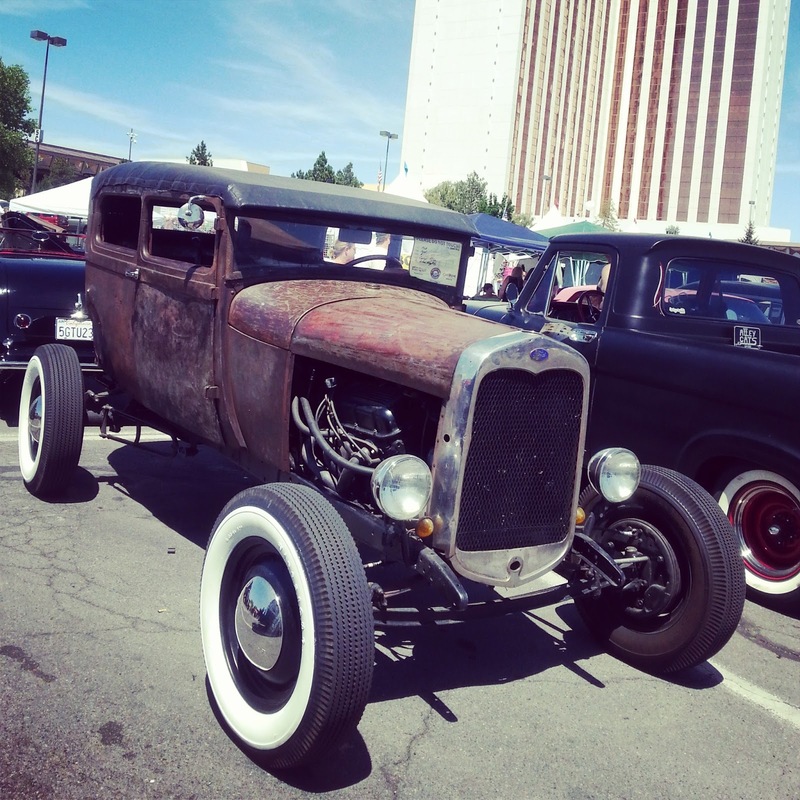 Reno has a lot of car stuff going on - Hot August Nights is our annual city-wide classic car celebration. We also have the National Automobile Museum; a large, private collection of vintage military vehicles; the Barrett-Jackson supercar auctions; and even Keke Rosburg's Formula1 race car chillin' in a hidden bunker in the middle of town. On top of those crazy things, we've Reno Rockabilly Riot, which I consider an art show, really. Rat Rods are like the Steampunks of the car world - cobbled together, tinkered with, boosted, frankensteined, chopped, all of it, and nothing at all to do with historical accuracy - it's the creation of fantastical automobiles by whatever means possible, not unlike the way Carol Shelby brought the infamous Shelby AC Cobra to life back in 1962. 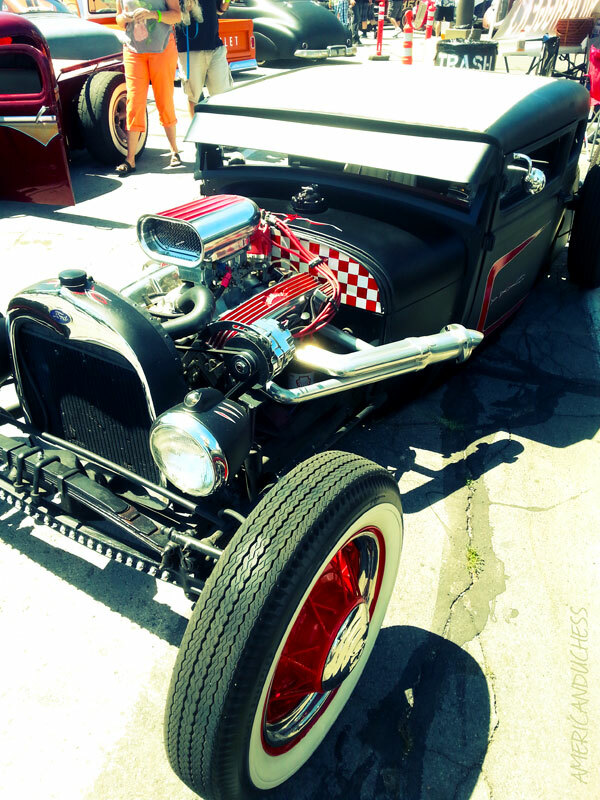 By the way.......I like cars. A lot. Hi Ladies! Today I need your votes to help decide some things about the future line of vintage-style seamed stockings I'm working for the shop. 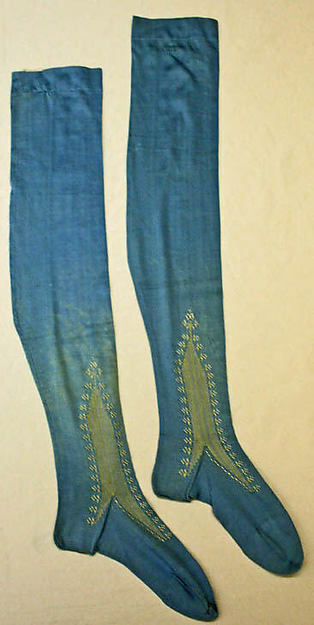 These stockings are knitted to fit the leg size, as opposed to using just stretchiness to fit. 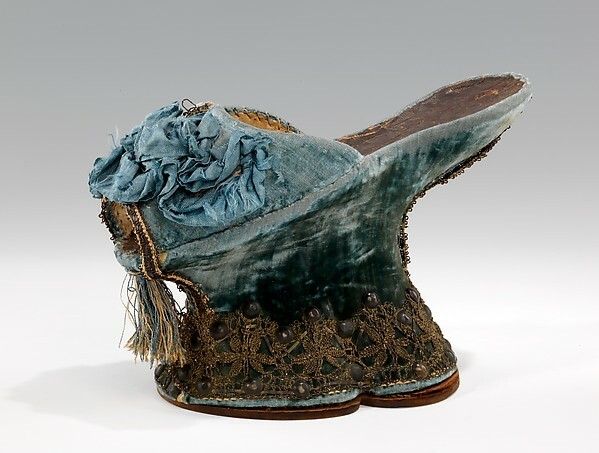 The seams are functional, and the heels feature an attractive reinforcement, such as a "point" or "cuban" style. 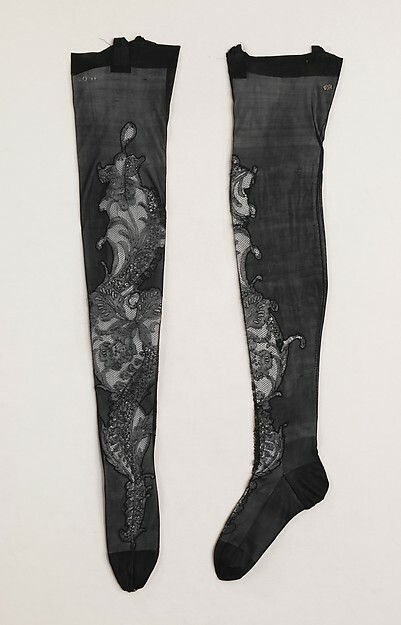 Fully-Fashioned stockings are the top-of-the-line in vintage legwear, and while gorgeous, are the most expensive option. 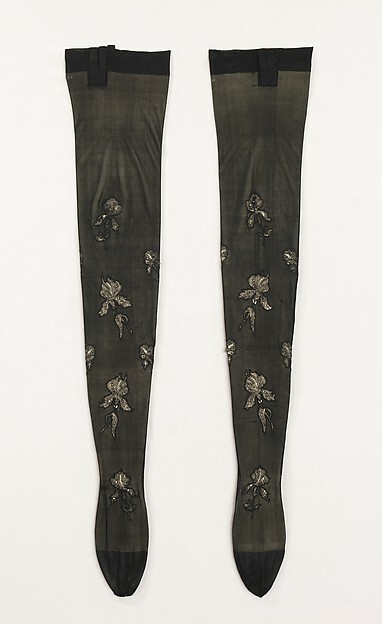 These stockings have a mock back seam, no decorative heel style, but a reinforced heel & toe. They fit the leg by stretch. 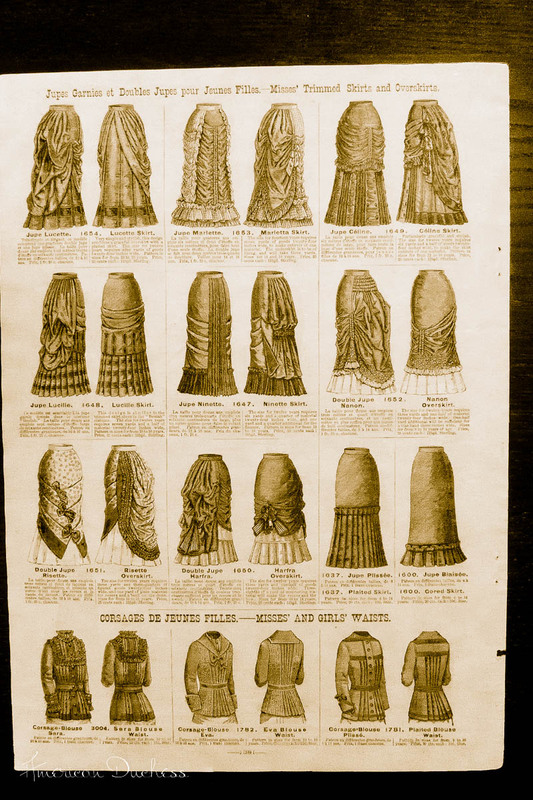 They are also well-made, but are about half to price of the Fully-Fashioned. They are also more readily available. 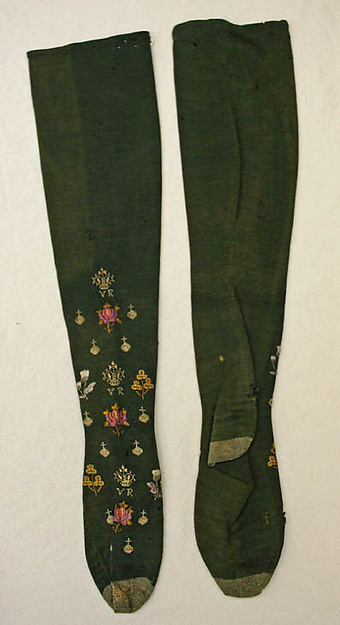 American Duchess seamed stockings will be closely based on 1920s and 1930s examples, and offered in several sizes. Colors will be true to the times, with tone-on-tone seams, welts, and reinforcements, not black, red, or anything risque. Straight-up vintage. 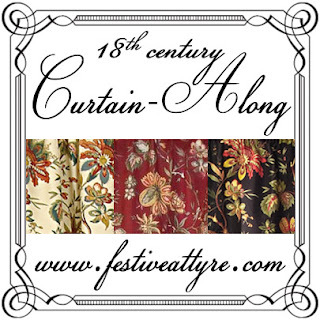 Last year, I joined Festive Attyre's "Curtain-Along" sewing event, when I fell in love with the Waverly "Felicite" curtains from Lowes, and made my favorite dress ever, the 1780 Indienne Robe a l'Anglaise. 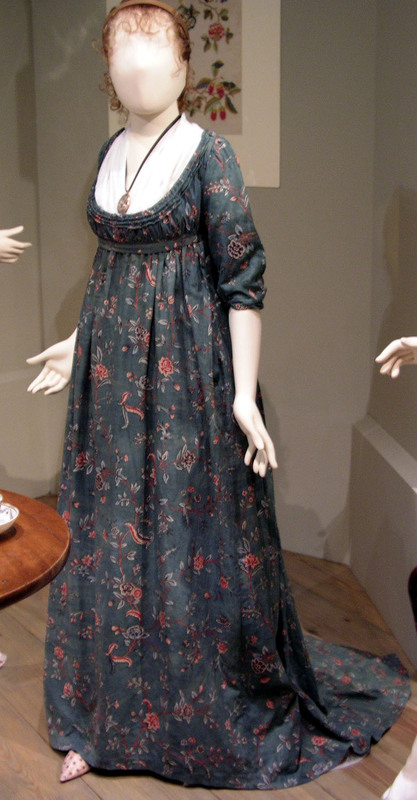 The gown is from the Museum of London. You won't find it on their site - this photo came from an image directory on the University of Vermont's website. No date, but it's round about 1790s/1800s. 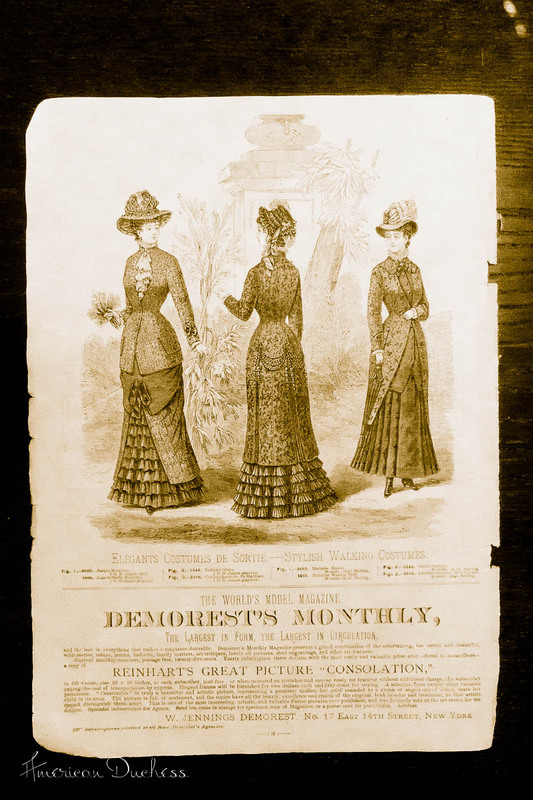 I adore the low, scooped next, the simple sleeves, and...of course...the fabric. 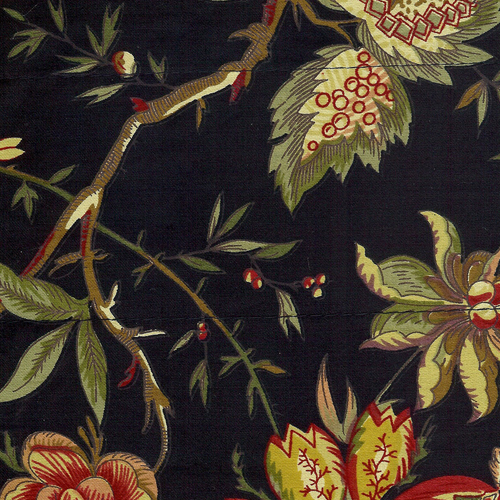 The original fabric has a dark teal ground, and a smaller chintz print than the black curtains I'll be working with, but I'm hoping to achieve the overall effect. 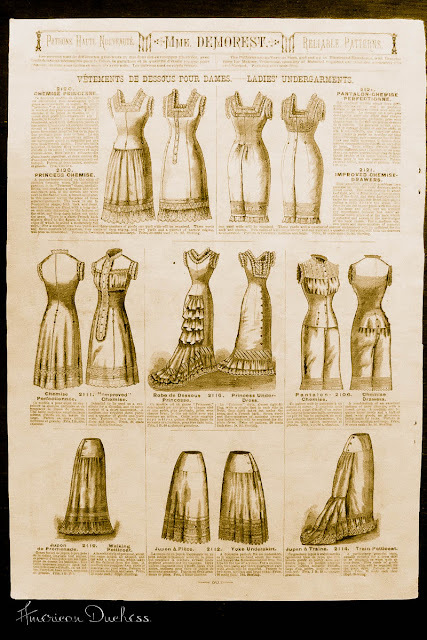 Thanks to several comments on Facebook, I know this dress is a bib-front, and the decoration at the neckline is cording. 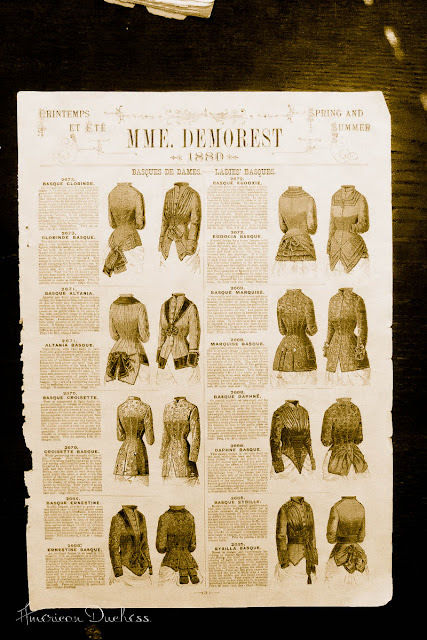 I am thinking of messing around with my Robe Royaliste pattern, to raise the waistline, or perhaps just draping a new pattern altogether. Wish me luck! It's the magical time of year when we make space in the garage-turned-warehouse, and have a big crackin' sale! Pompadours are on clearance, to make room for the new version. 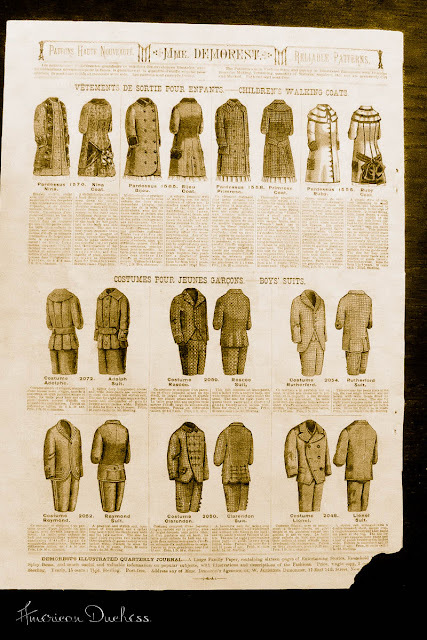 We've also sorted through the stock and found a handful of Gibsons, 23Skidoos, and ivory Tavistock boots that have minor cosmetic flaws, so those are on sale for silly prices. 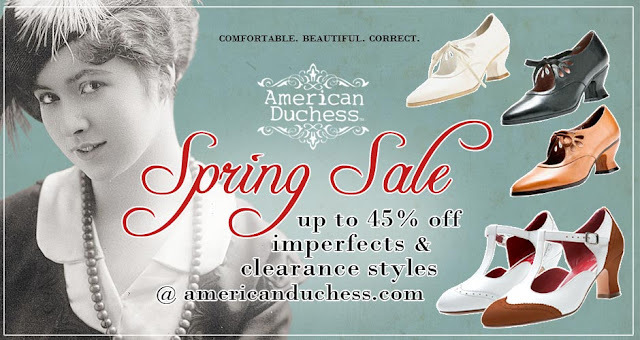 Imperfects tend to go out the door quite quickly, so if you've been yearning for a pair of AD shoes, here's your chance to snag some for a greatly reduced price. This is "first-come-first-served," and when they're gone, that's it. 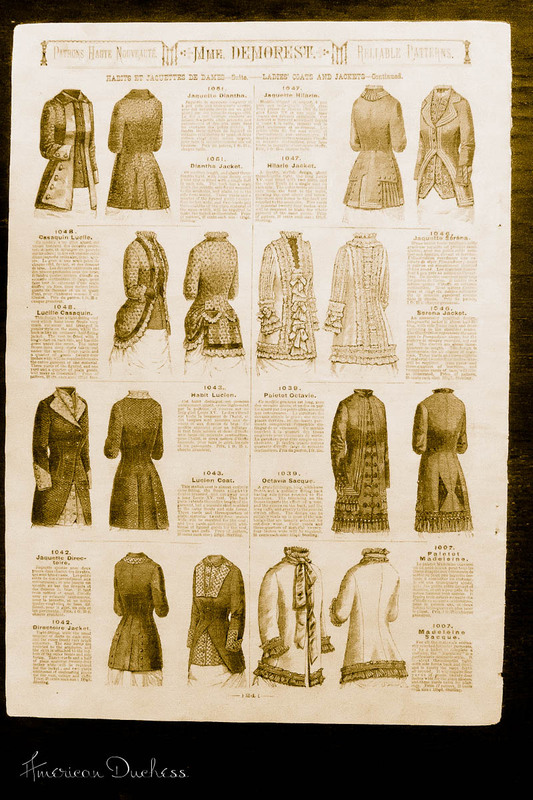 Last weekend a dear friend, Jenny, gave me an incredible gift - a complete pattern catalog from 1880. 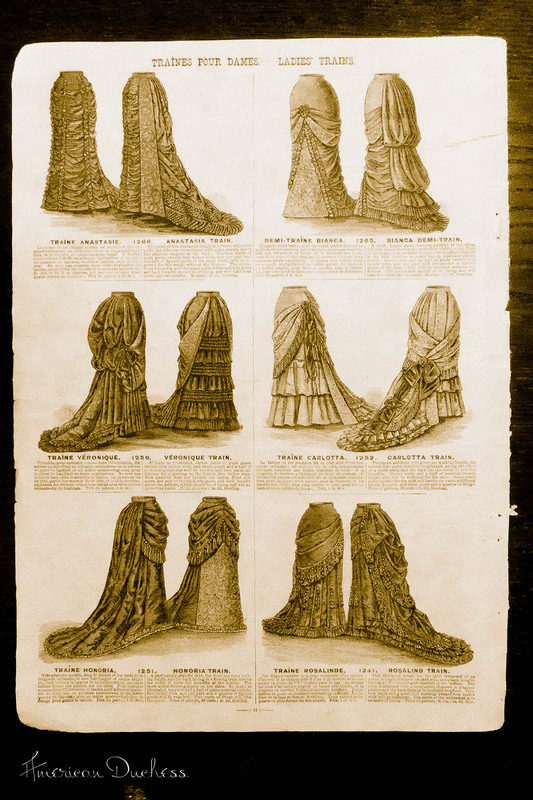 I've been studying it with great interest and costume lust, careful to keep the drool from dripping on the fragile pages, and now, of course, I am enamored with 1880 and want to make about 16 of the pieces shown in the catalog. I'm still working on cleaning up, cropping, and correcting the images. The original catalog is approx. 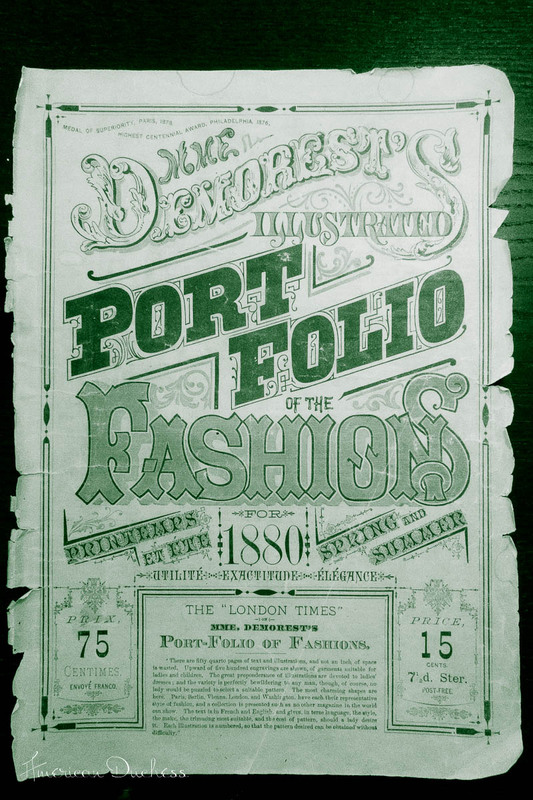 14" x 10", with *tiny* print, barely readable on the original. 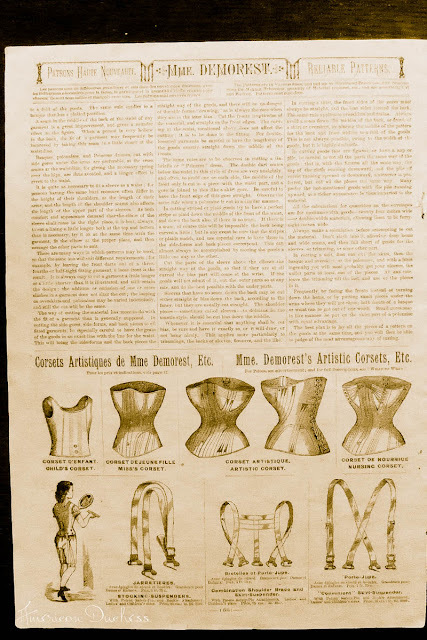 I'm afraid the descriptions of the images, in both French and English, may not survive digitizing, but the pictures, at least, are lovely and telling. 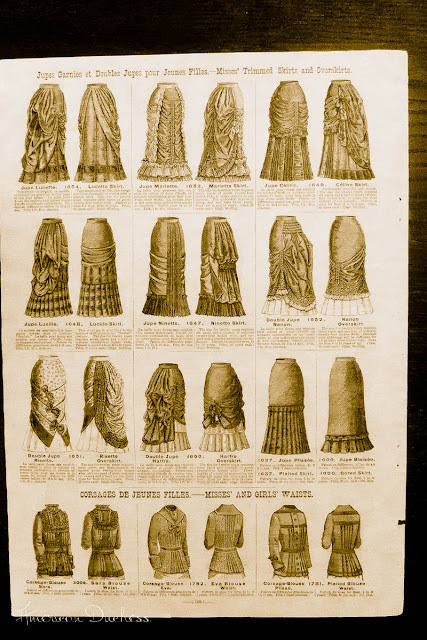 This was, like, the Vogue pattern catalog of 1880!